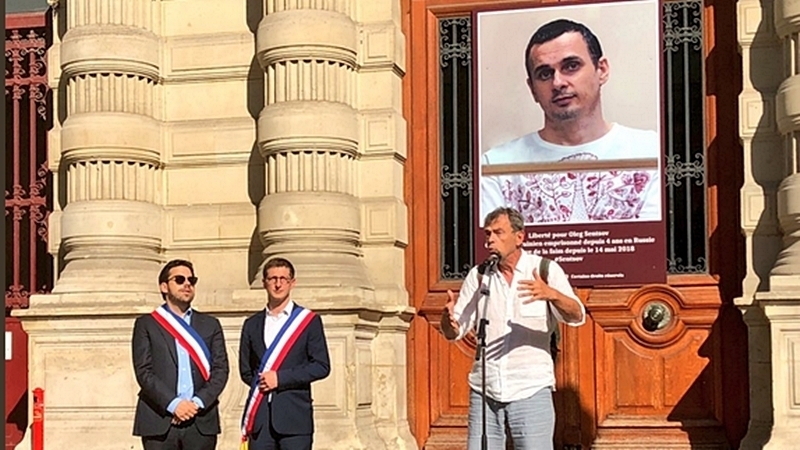 The Mayor's Office of the 4th district in Paris held an action in support of the Ukrainian political prisoner Oleg Sentsov, Ukrainian writer Irena Karpa reported on her Facebook page. A portrait of the Ukrainian political prisoner was placed on the building of the City Hall. Deputy Mayor of Paris Patrick Klugman noted that such actions will be held until Sentsov is released. Klugman said he hopes for justice and the liberation of Oleg Sentsov. “We fully support the Ukrainian filmmaker Oleg Sentsov, who has been detained for four years in Russia. We were hoping for his freedom, and now we are fear forf his life. We hope for justice. Justice is freedom for him," the Deputy Mayor of Paris wrote on Twitter. QHA reported that Poland, the United States and several other countries are taking part in drafting of an international declaration demanding the release of Oleg Sentsov. The declaration says that Sentsov has been on a hunger strike for more than two months, and Moscow fails to respond to international appeals. Earlier, Oleg Sentsov asked his lawyer Dmitry Dinze to visit him more rarely. He does not see the point in frequent visits to him, because nothing is happening around his case. Sentsov refused hospitalization: "I will live as long as I endure"